The Schuhfried VTS enables computer-assisted application of a large number of highly diverse psycho-diagnostic tests and measuring procedures. In developing the system much emphasis was placed on transparent structure and largely uniform design. It is therefore simple to operate and easy to understand and does not require any special computer skills. The VTS basic module is required for administration of any of the available tests. The Schuhfried VTS supports the administration of both single tests and test batteries. Many of the single tests are available in different test versions. These test versions may differ, for example, in terms of test duration or difficulty or may be parallel forms. They are characterized by different parameters reflecting specific test requirements. They have been designed for administration to a specific population (e.g. psychiatric patients, children, etc.) or for special measuring purposes (e.g. repeated measurements). Test batteries are compiled from the available single tests and test versions. The IVPE is a multidimensional personality inventory, through which the legally stipulated personal characteristics to check the readiness for the adjustment to traffic can be captured fairly and reliably. The IVPE is used to capture the traffic psychologically relevant personality features of sensation seeking, social sense of responsibility, self-control and emotional stability, all in the context of traffic psychological assessments. Main area of application: traffic psychology. The inventory is a computer-based personality test for the recording of traffic psychologically relevant personality features: social sense of responsibility, self-control, emotional stability and sensation seeking. Social behavior in traffic is viewed primarily in connection with the ability and the motivation to observe standards and rules. The recording of social sense of responsibility is based on the three- component model for the attitude towards social values of Stahlberg and Frey (1990). The General Theory of Crime by Gottfredson and Hirschi (1990) serves as the basis for the item construction of the self-control scale. Neuroticism, defined as the opposite of emotional stability, is registered in personal characteristics which, according to Ostendorf (1990), characterize these latent personality dimensions the best. The construct sensation seeking is ascertained with a scale which was designed based on the sub dimensions thrill and adventure seeking, posited by Zuckerman (1994). The choice of this sub-scale is justified by its significance for roadworthy behavior (cf. Jonah, 1997). The subject assesses the extent to which certain statements from the spheres of traffic, leisure time and work apply to him / her. The answer is entered on an answer bar with a sliding marker. A correction of the preceding item is possible. 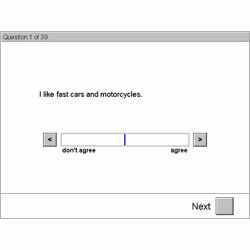 There is one test form available. The analogous input is recalculated dichotomously by the evaluation program. Different calibrations of the analogous scales are used in each scale in order to meet the trend of socially desired answers. For all scales the results are issued in raw scores, T-values, and percentile scores. Reliability in terms of internal consistency is given due to compliance with the Rasch model for each scale. Because of the validity of the Rasch model and the theory-based construction of items, the construct validity of the individual scales can be assumed. Validity has in addition been demonstrated by a confirmatory factor analysis. Sommer, Herle & Wenzl (2004) carried out a study of the criterion validity which was able to show that accident-free drivers could be significantly distinguished from competent drivers who were ordered to attend a psychological assessment centre for drivers in accordance with § 14 (2) FSG-GV (health regulations within Austrian driving licence law) on the basis of their results in the IVPE. Norms are available for a sample of 360 people (56.9% men, 43.1% women; age range 20-72). The data was collected in Vienna (Austria) at the end of 2003 / beginning of 2004. The Schuhfried VTS enables computer-assisted application of a large number of highly diverse psycho-diagnostic tests and measuring procedures. Multi-dimensional personality inventory, through which the legally stipulated personal characteristics to check the readiness for the adjustment to traffic can be captured fairly and reliably.